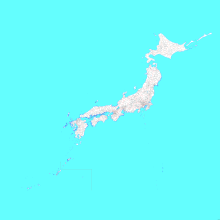 Map of all Municipalities of Japan including disputed territories. Japan has three levels of government: national, prefectural, and municipal. The nation is divided into 47 prefectures. Each prefecture consists of numerous municipalities, with 1,719 in total (January 2013 figures) . There are four types of municipalities in Japan: cities, towns, villages and special wards (the ku of Tokyo). In Japanese, this system is known as shikuchōson (市区町村), where each kanji in the word represents one of the four types of municipalities. Some designated cities also have further administrative subdivisions, also known as wards. But, unlike the Special wards of Tokyo, these wards are not municipalities. The status of a municipality, if it is a village, town or city, is decided by the prefectural government. Generally, a village or town can be promoted to a city when its population increases above fifty thousand, and a city can (but need not) be demoted to a town or village when its population decreases below fifty thousand. The least-populated city, Utashinai, Hokkaidō, has a population of merely four thousand, while a town in the same prefecture, Otofuke, Hokkaidō, has nearly forty thousand residents, and the country's largest village Yomitan, Okinawa has a population of 40,517. The capital, Tokyo, no longer has city status. Tokyo Prefecture now encompasses 23 special wards, each a city unto itself, as well as many other cities, towns and even villages on the Japanese mainland and outlying islands. Each of the 23 special wards of Tokyo is legally equivalent to a city, though sometimes the 23 special wards as a whole are regarded as one city. For information on the former city of Tokyo, see Tokyo City; for information about present-day Tokyo Prefecture, see Tokyo. The same kanji which designates a town (町) is also sometimes used for addresses of sections of an urban area. In rare cases, a municipal village might even contain a section with the same type of designation. Although the kanji is the same, neither of these individual sections are municipalities unto themselves. Sometimes, the section name is a remnant from gappei, a system where several adjacent communities merge to form a larger municipality, where the old town names are kept for a section of the new city, even though the resulting new city may have a completely different name. Subprefectures are branch offices of the prefectures and not municipalities by themselves. Districts are not current municipalities but names of groups of towns and villages. Provinces are not current municipalities but (almost obsolete) names of geographical regions similar to prefectures.